Residents of Burlington's Old North End have been observing drugs exchanged outside their homes and discovering needles in parks for awhile. But when a 31-year-old man was shot in the leg near JR's Corner Store on North Street several weeks ago, it was the final straw for some. 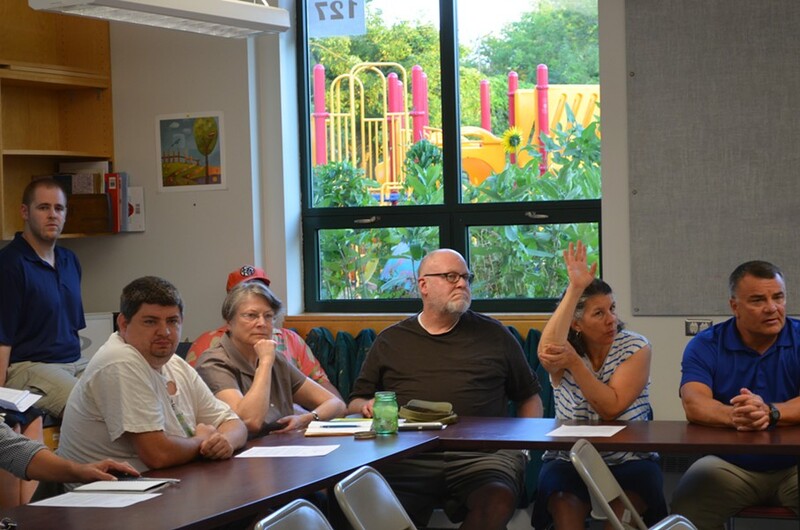 "I was very, very upset about the shooting," said city Councilor Jane Knodell (P-Central District) during a meeting of the city council's public safety committee Wednesday night at the Sustainability Academy on North Street, across the street from the shooting scene. She called it a "real signal that things have escalated." The committee is holding four meetings in different neighborhoods to address residents' concerns. Both Mayor Miro Weinberger and incoming police chief Brandon del Pozo attended, as did Howard Center staff. Residents wanted to know how they could assist police, but they also had plenty of advice for law enforcement. Several people reported having unpleasant or unhelpful encounters with police officers and dispatchers and wondered why officers weren't more aggressive about putting a halt to the blatant drug activity they've witnessed. Seven Days reported on similar complaints in a recent story that recounted how one woman in the city's lower Hill Section hung a sign in a tree to discourage drug activity. Lt. Dennis Duffy explained that the department doesn't have the resources to stop every deal on the street, and its drug detectives are "trying to get the bigger fish" — the major dealers. But he encouraged people to call the department's drug tip line when they witness suspicious behavior. One young professional woman who lives near the Shopping Bag — a North Street store where people often loiter outside — said she'd made several calls to the police but was unnerved when, earlier this week, someone referred to her as a "rat" inside the store. "I'm terrified," she said, asking not to be named. Stu McGowan, owner of many eclectically colored apartment buildings in the Old North End and a resident of the neighborhood for three decades, said this is the third wave of drug activity he's witnessed since moving here. He described one strategy he found successful during an earlier spell: "What the police department did was they essentially assigned me an officer that I could get ahold of directly" rather than going through dispatch. "Is that something you're interested and willing to do?" McGowan asked del Pozo, who will be sworn in September 1. "Absolutely," del Pozo responded. "I will be reorganizing the police department to make officers and supervisors more accessible to citizens." He declined to offer further details, noting that he's not yet the chief. Another Old North End resident, Rich Wood, noted one positive change: the recent closure of a laundromat where, he said, he'd witnessed drug activity and other problems. Later in the meeting, someone proposed that the police set up an auxiliary station at that vacant storefront on North Street. Bill Bissonette, who owns apartment buildings and the former laundromat, was at the table. "I'll give them rent free for a year," he offered. "I'll plant flowers out front!" another woman volunteered. Del Pozo didn't make any promises, but he took notes. When the meeting ended shortly after 9 p.m., North Street was relatively quiet. Across the street from the school, two men drank bottles of beer from the back of a pickup truck. Outside the Shopping Bag, a police officer chatted amiably with a man sitting cross-legged on the ground.